(Crowd) Funding: we are seeing more buyside firms invest in vendors. Some vendors are also interested in crowdfunding from buyside firms. If either is of potential interest to your fund, please contact our CEO – emmett.kilduff@eaglealpha.com. ESG: we are seeing accelerating interest in ESG datasets from fundamental managers who don’t have a direct ESG mandate. These datasets can be used at the screening stage in order to highlight high risk companies. They also enable analysts to dive deeper into potential issues around a single company. Some discretionary long/short are using these to find short ideas. This can include everything from employee turnover, audit, governance, social media and NLP to assess audit/earnings statements. Asia: interest in alternative data is increasing in this region but how much do people know about the local nuances and compliance aspects? This is something we have focused on within our Data Forum and Data Sourcing solutions. 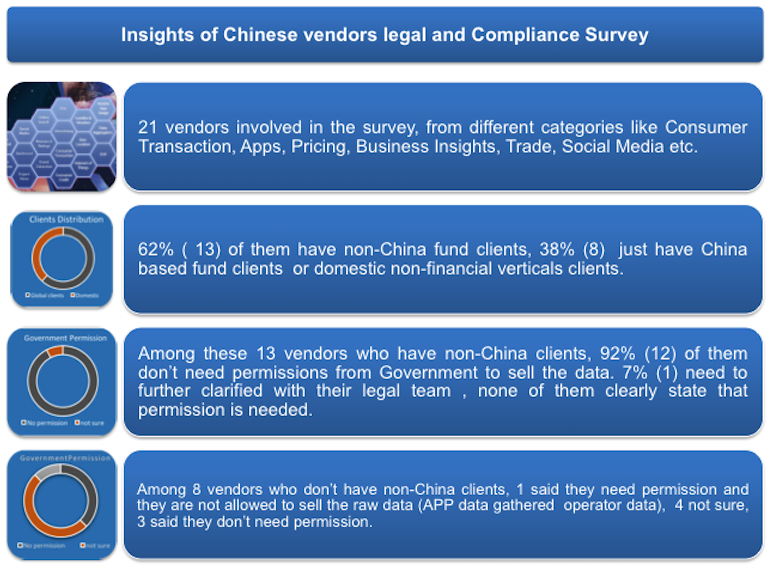 We recently surveyed 21 vendors in China across various alt data categories – 13 of them have non-China clients but note 8 have China clients only. We are now doing dedicated Data Sourcing calls with clients in relation to China data. NYC Conference: our next “access and alpha” conference will be held in NYC on November 29th. JPMorgan is the platinum sponsor and the keynote speaker is Vasant Dhar. To learn more and register contact events@eaglealpha.com. C-Suite Webinar: join a webinar on November 14th that is entitled “Getting your organization ready for the data deluge – a webinar for senior management of buyside firms”. To register contact webinars@eaglealpha.com. Quant: this vendor provides a live database of global marine cargo trade activity between 7,000+ ports, including cargo details and trade indices for monitoring macro and micro performances. Discretionary: this company provides European consumer transaction dataset with coverage in Europe and South America going back to January 2016. New: a China ESG data provider. This company is a leading consultancy providing professional services in green finance and responsible investment in China. Open sourcing this week: BERT (Bidirectional Embedding Representations from Transformers) – this language representation model conditions based on left and right context to achieve state-of-the-art results on eleven NLP tasks. Google open-sourced a Github with this algorithm and pre-trained models. Colab notebook is also available here. What we’re reading this week: Horizon – Facebook’s Open Source Applied Reinforcement Learning Platform. This publication by Facebook walks through some real-world examples of using Horizon, their open-source reinforcement learning platform, in live environments as opposed to simulations. Examples include a system to optimize the frequency and topic of notifications sent to Facebook users at an individual level. This type of live reinforcement learning is applicable to the financial vertical’s many live environments. Legal & Compliance – DDQ: the first draft of the standardized DDQ document to be presented to the Data Forum members next week. Efficiency Improvements – Standardized Metadata: the output of this working group will be finalized and published on November 14th. To learn more contact dataforum@eaglealpha.com. Search: we overhauled the search engine to facilitate easier sourcing of new interesting datasets. Clients can search by keywords and the search engine will search for it in a datasets title, summary, and description. We have also added acronyms and synonyms to help search for datasets that are purposely misspelled by vendors. Data Analytics: we leveraged alternative data to highlight the weaker update of the new iPhones. Our Data Analytics team used online search and social media data to correctly predict this trend. If you would like to learn more about Eagle Alpha’s Data Analytics offering or our new Eagle Edge platform, please contact enquiries@eaglealpha.com. New MIT Study: Big Data Disproportionately Benefits Large Companies. Disruption In Alternative Asset Management Reaches Tipping Point. What is alternative data? Insights from the CFA FinTech Symposium. Asset managers accelerate use of alternative data.